"Kimbrel" redirects here. For similiar terms, see Kimbrell (disambiguation). 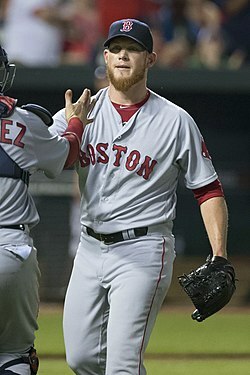 Craig Michael Kimbrel (born May 28, 1988) is an American professional baseball pitcher who is a free agent. He has played in Major League Baseball (MLB) for the Atlanta Braves, San Diego Padres, and Boston Red Sox. He is a seven-time All-Star, and was the youngest pitcher in MLB history to record 300 saves. He is known for his triple-digit fastball, as well as his unique pre-pitch stare. Listed at 6 feet 0 inches (1.83 m) and 210 pounds (95 kg), he both throws and bats right-handed. As a rookie with the Braves in 2011, Kimbrel was named their closer, and set an MLB record for saves by a rookie, with 46. He was awarded the National League's 2011 Rookie of the Year Award. He led the National League in saves for four consecutive seasons, 2011 through 2014. He recorded his 200th save in June 2015 with the Padres, and his 300th save in May 2018 with the Red Sox. Craig is the son of Mike and Sandy Kimbrel. He attended Lee High School in Huntsville, Alabama (where he played baseball and was a quarterback in football), and Wallace State Community College. At Wallace State, in 2007 Kimbrel was 8-0 with a 1.99 ERA as a freshman, as the closer and a spot starter, and in 2008 he was 9-3 with a 2.88 ERA, striking out 123 hitters in 81 innings, mainly as a starter. He was drafted by the Atlanta Braves in the 33rd round of the 2007 draft, but elected to remain at Wallace State in order to improve his draft position. He was then taken by the Braves in the third round of the 2008 draft, and was the 96th player chosen. Kimbrel got his first call-up from the Gwinnett Braves on May 15, 2010, to replace the injured Jair Jurrjens on the roster. He was called up for the second time in his career on June 4, 2010, to replace Takashi Saito, who was placed on the 15-day DL. He earned his first major league save on September 19, 2010 against the New York Mets. Kimbrel's record for the 2010 season was 4–0, with one save and a 0.44 ERA in 20​2⁄3 innings. He recorded 40 strikeouts and 16 walks. In the 2010 NLDS, he was the losing pitcher in Game 3 against the eventual World Series Champion San Francisco Giants. Kimbrel made the roster to start the 2011 season as the team's primary closer. He was successful in his first four save opportunities before blowing his first career save on April 21, 2011. On June 3, 2011 in a game versus the New York Mets, Kimbrel passed the record for most saves by a National League rookie before the All-Star break. He is the fastest Braves pitcher to reach 100 career strikeouts, doing so in 59​1⁄3 career innings. His new record surpassed the previous record set by John Rocker in the 1998–1999 season, where it took Rocker 70 career innings to reach the 100 career strikeout mark. On July 5, his 26th save matched Jonathan Papelbon's record for most saves by a rookie before the All-Star break. On July 7, Kimbrel's 27th save of the year against the Colorado Rockies broke Papelbon's record. Kimbrel was selected to the 2011 All Star Game during his first full season in the majors. San Francisco Giants manager Bruce Bochy choose Kimbrel as a replacement for Giants pitcher Matt Cain. On July 22, 2011 in a game versus the Cincinnati Reds, Kimbrel broke the Braves rookie record for saves in a season (31). On August 9, 2011 in a game versus the Florida Marlins, Kimbrel tied the National League rookie record for saves in a season (36 by Todd Worrell of the St. Louis Cardinals in 1986). He broke that record on August 17 in a game versus the San Francisco Giants. On August 21, 2011, Kimbrel recorded his 100th strike out which coincided with his 39th save of the season and a string of 30​2⁄3 innings without yielding a run. On August 23, 2011, Kimbrel recorded his 40th save, tying the rookie save record of Neftalí Feliz. He subsequently broke this record with his 41st save on August 31 with two strikeouts in a game against the Washington Nationals. At the time, he led the majors in saves and had not given up a run in his last 34 innings. The following night September 1, 2011, Kimbrel surpassed Cliff Lee's record of thirty-four scoreless innings with 34​2⁄3 scoreless innings for the longest scoreless streak in the majors in 2011. He was named the NL Rookie of the Month and MLB Delivery Man of the Month for August 2011. His scoreless inning streak came to an end after 38​1⁄3 innings, on September 9, 2011. The Braves season ended when he blew a save against the Philadelphia Phillies in the last game of the season. The loss knocked Atlanta out of playoff contention, completing a late-season collapse that squandered an early-September lead of 8½ games. Kimbrel's mediocre September (4.76 ERA) led to charges that manager Fredi González had overworked him over the course of the season. Kimbrel ended the season tied for the National League lead with 46 saves—shattering the previous rookie record of 40, set by Feliz in 2010—and led the Major Leagues with 127 strikeouts in 77 innings of relief. On November 14, the Baseball Writers' Association of America announced the results of their 2011 National League Rookie of the Year vote; Craig Kimbrel received all 32 first-place ballots—the first unanimous selection since 2001 winner Albert Pujols—for 160 points. Freddie Freeman finished second in the voting with 21 second-place votes and seven third-place votes, for a total of 70 points—making the pair the first teammates to take the top two spots since 1989, when the Chicago Cubs' Jerome Walton and Dwight Smith came in first and second in the balloting. The only other time two Braves finished in the top five, the organization was still located in Milwaukee—Gene Conley was voted third-best rookie of the 1954 season; Hank Aaron came in fourth. He was also named the Players Choice Awards NL Outstanding Rookie by the Major League Baseball Players Association. Kimbrel again made the All-Star team in 2012. He struck out the two batters he faced. He won the MLB Delivery Man Award for September 2012. On September 26, he struck out four batters in the ninth inning. Kimbrel was thoroughly dominant throughout the 2012 season. He led the National League with 42 saves (in 45 opportunities) and Win Probability Added among pitchers. He struck out 116 batters in ​62 2⁄3 innings, producing a K/9 rate of 16.7. In so doing, he also became the first pitcher in history to strike out at least half the batters he faced during a season. He also went to an 0–2 count on 56% of the batters he faced. Kimbrel allowed only 3.9 hits and 2.0 walks per 9 innings he pitched, giving him a WHIP of 0.65 and a batting average against of .126. He finished with an ERA of 1.01. He won the NL Rolaids Relief Man Award. Kimbrel finished fifth in the 2012 National League Cy Young Award voting, and eighth in the 2012 National League MVP voting. Kimbrel began the 2013 season with three blown saves during his first nine save opportunities, tying his personal record for blown saves during the entire 2012 season. Nonetheless, on May 9, 2013 in a game against the San Francisco Giants, Kimbrel earned his 100th save making him the second youngest player in MLB history to reach that mark. With a save against the Cardinals on July 27, 2013, he became only the second Atlanta pitcher after John Smoltz to have three 30-save seasons. Kimbrel surpassed John Smoltz's Braves record of 27 consecutive saves on August 17, 2013. On September 27, Kimbrel recorded his 50th save of the season in a game against the Philadelphia Phillies. In doing so, he became the 11th pitcher in Major League history to have a 50-save season. He won the MLB Delivery Man of the Year Award (in all MLB) and also was voted the "GIBBY Awards" Closer of the Year – by the fans, media, team front-office personnel, former players, and SABR. Kimbrel with the San Diego Padres in 2015. On April 5, 2015, Kimbrel was traded to the San Diego Padres along with outfielder Melvin Upton, Jr., in exchange for Carlos Quentin, Cameron Maybin, prospects Matt Wisler, Jordan Paroubeck, and the 41st overall pick in the 2015 MLB draft. On June 8, Kimbrel recorded his 200th career save against his former team, the Braves. He became the fastest pitcher ever to reach that milestone, taking only 318 games to do so. In his one season with the Padres, Kimbrel made 61 appearances, finishing 53 games while recording 39 saves; he struck out 87 while walking 22 in ​59 1⁄3 innings pitched with a 2.58 ERA. On November 13, 2015, the Padres traded Kimbrel to the Boston Red Sox in exchange for Manuel Margot, Javier Guerra, Carlos Asuaje, and Logan Allen. On July 8, 2016, Kimbrel injured his knee while taking warmups. The next day, an MRI revealed that there was a tear in the medial meniscus of the left knee. The injury required surgery, and three to six weeks to recover. He returned to the bullpen at the start of August. For the 2016 Red Sox, Kimbrel made 57 regular season appearances, finishing 47 games while recording 31 saves. In 53 innings pitched, he had a 3.40 ERA while striking out 83 and walking 30. In the 2016 American League Division Series, Kimbrel made two appearances; he retired all four batters he faced, three by strikeout, as the Red Sox were swept by the Cleveland Indians. Going into the 2017 season, Kimbrel changed his song from "Welcome to the Jungle" by Guns N' Roses to Ted Nugent's "Stranglehold". On May 11, 2017 against the Milwaukee Brewers at Miller Park, Kimbrel struck out the side in the ninth inning on nine consecutive pitches, joining Pedro Martínez and Clay Buchholz as the only pitchers in franchise history to accomplish this feat, commonly referred to as an immaculate inning. Two weeks later, Kimbrel recorded a second four-strikeout inning while facing the Texas Rangers. For the 2017 Red Sox, Kimbrel made 67 regular season appearances, finishing 51 games while recording 35 saves. In 69 innings pitched, he had a 1.43 ERA while striking out 126 and walking 14. Of all MLB pitchers, he held right-handed batters to the lowest batting average, .108 (in 30 or more innings). In the 2017 American League Division Series, Kimbrel made two one-inning appearances; he faced a total of 12 batters, giving up four hits, one walk, and one run while recording two strikeouts, as the Red Sox lost to the eventual World Series champions, the Houston Astros. On May 5, 2018, facing the Texas Rangers, Kimbrel recorded his 300th career save. He achieved this milestone in fewer games (494), fewer save opportunities (330), and at a younger age (29) than any other pitcher. On July 8, Kimbrel recorded his 27th save of the season, and was named to the 2018 MLB All-Star Game. For the 2018 regular season, Kimbrel recorded 42 saves in 63 appearances, pitching to a 2.74 ERA with 96 strikeouts in ​62 1⁄3 innings. In the postseason, Kimbrel recorded six saves while allowing seven earned runs in ​10 2⁄3 innings, as the Red Sox went on to win the World Series over the Los Angeles Dodgers in five games. On November 12, Kimbrel declined Boston's one-year, $17.9 million qualifying offer, thus becoming a free agent. Kimbrel did not sign with any teams during the off-season, remaining a free agent into the 2019 season. Kimbrel was named the closer for Team USA in the 2013 World Baseball Classic. Despite not surrendering one lead off double all year with the Braves in 2012, Kimbrel gave one up to Nelson Cruz of the Dominican Republic in their round two matchup. Kimbrel would go on to give up two runs in the game, and be the losing pitcher in Team USA's 3–1 loss to the eventual champions. Kimbrel uses a combination of a four-seam fastball and a power curveball to get outs. His fastball averages 97–98 mph and occasionally tops out at 101 mph. His curve, thrown with a "spike" grip, stays in the mid-to-upper 80s. The whiff rate of his four-seamer is 33%, and the curve at is 52%. This combination contributes to a strikeouts per nine innings rate of 14.7 over Kimbrel's career so far (as of 10 October 2018[update]). He is also tied for third among all pitchers from 2002–2012 in the highest percentage of pitches that resulted in swinging strikes. Kimbrel's four-seam fastball was the 12th-fastest among Major League relievers in the 2011 season. In addition, he threw the hardest curveball, averaging 87 mph. His fastball had the fifth-highest whiff rate among relief pitchers' fastballs (32%), and he also had the highest whiff rate of any reliever's curveball, at better than 55%. His pre-pitch stance has also been widely recognized, and has been dubbed "Kimbreling", or "How to Destroy Your Back by 35", or "Spider Arms". Kimbrel has two brothers, Alan and Matt. Matt Kimbrel played baseball in the Braves minor league system for three seasons before being released. Craig married former Wallace State cheerleader Ashley Holt  in 2012. The couple's first child, a daughter named Lydia Joy, was born on November 3, 2017. She was born with heart defects and has undergone two surgeries thus far. ^ Trevor Hoffman, who achieved it twice, and Francisco Rodríguez are the others. ^ McCarter, Mark (November 15, 2011). "Cause for celebration: Huntsville's Craig Kimbrel is National League Rookie of the Year". The Birmingham News. Retrieved February 28, 2015. ^ a b Hummer, Steve (May 21, 2011). "Braves closer took unusual path to role". The Atlanta Journal-Constitution. Retrieved December 5, 2013. Kimbrel the player, though, is an entirely different beast now. The kid just out of Huntsville, Ala., Lee High was nobody's prodigy. ^ Mark Bowman. "Strained left hamstring lands Jurrjens on DL". MLB.com. Retrieved September 12, 2011. ^ Evan Drellich (June 5, 2010). "Kimbrel ready for second taste of bigs". MLB.com. Retrieved September 12, 2011. ^ Rogers, Carroll (June 3, 2011). "Jones, Hinske homers help Braves rally past Mets". ajc.com. Archived from the original on June 4, 2011. Retrieved September 12, 2011. ^ David O'Brien (June 28, 2011). "Kimbrel surpasses Rocker strikeout mark". AJC.com. Archived from the original on August 26, 2014. Retrieved November 14, 2015. ^ O'Brien, David (July 5, 2011). "Lowe hits (3 RBIs), pitches Braves to win". ajc.com. Archived from the original on September 7, 2011. Retrieved September 12, 2011. ^ David O'Brien (July 7, 2011). "Kimbrel breaks first-half rookie saves record". AJC.com. Archived from the original on July 11, 2011. Retrieved September 12, 2011. ^ Carroll Rogers (July 10, 2011). "Kimbrel named as replacement to NL All-Star team – updated". AJC.com. Archived from the original on October 23, 2012. Retrieved November 14, 2015. ^ Carroll Rogers (August 21, 2011). "Braves postgame quotes following Sunday's win over Arizona". Blogs.ajc.com. Archived from the original on August 26, 2014. Retrieved November 14, 2015. ^ David O'Brien (August 22, 2011). "Braves' hitting turnaround is more than just Uggla". Blogs.ajc.com. Archived from the original on August 26, 2014. Retrieved November 14, 2015. ^ O'Brien, David (September 1, 2011). "Derek Lowe homers, Craig Kimbrel gets record save". ajc.com. Archived from the original on May 29, 2012. Retrieved November 14, 2015. ^ O'Brien, David (September 2, 2011). "Jones, McCann homers send Braves to win". ajc.com. Retrieved November 14, 2015. ^ Chris Vivlamore (September 8, 2011). "Braves notes: Beachy gets strikeout mark". Blogs.ajc.com. Archived from the original on October 23, 2012. Retrieved September 12, 2011. ^ "Craig Kimbrel named winner of the Major League Baseball Delivery Man of the Month Award for August" (Press release). MLB.com. September 8, 2011. Retrieved September 12, 2011. ^ "Latest collapse for Atlanta Braves came before playoffs this time". ESPN.com. Associated Press. September 29, 2011. Retrieved August 29, 2012. ^ "Craig Kimbrel 2011 Pitching Splits". Baseball-Reference.com. Retrieved August 29, 2012. ^ Powers, Matt (May 2, 2012). "Atlanta Braves: 10 Keys to Keeping the Phillies in the Rear-View Mirror". Bleacher Report. Retrieved August 29, 2012. ^ Neyer, Rob (August 27, 2012). "Braves' Brilliant Relievers Being Paced For September". SB Nation. Retrieved August 29, 2012. ^ "BBWAA.com: Official site of the Baseball Writers' Assn. of America". bbwaa.com. Archived from the original on July 7, 2012. Retrieved August 4, 2015. ^ "Braves' Craig Kimbrel, Rays' Jeremy Hellickson win Rookie of the Year Awards". Major League Baseball. Retrieved August 4, 2015. ^ "Players Choice Awards History". MLB.com. Major League Baseball Players Association. Retrieved October 31, 2016. ^ "July 10, 2012 All-Star Game Play-By-Play and Box Score". Baseball-Reference.com. Retrieved August 29, 2012. ^ "Craig Kimbrel Of The Atlanta Braves Named The Major League Baseball Delivery Man Of The Month For Septembert". MLB.com (Press release). Major League Baseball. October 2, 2012. Retrieved October 3, 2012. ^ "Martin Prado, Braves shake off celebration to beat Marlins". USA Today. Associated Press. September 26, 2012. Retrieved March 1, 2018. ^ a b "Craig Kimbrel Statistics and History". Baseball-Reference.com. Retrieved October 7, 2012. ^ Pouliot, Matthew (October 3, 2012). "Craig Kimbrel first in history to fan half his batters faced". Hardball Talk. NBC Sports. Retrieved October 7, 2012. ^ "Craig Kimbrel Pitching Statistics and History". Baseball-Reference.com. Retrieved October 7, 2012. ^ "Rolads Relief Man Award". rolaidsreliefman.com. Archived from the original on October 26, 2012. ^ "2012 NL CY Young voting results". BBWAA.com. Retrieved November 15, 2012. ^ "2012 NL MVP voting results". BBWAA.com. Retrieved November 15, 2012. ^ "Kimbrels 100th save comes at historic rate". Fox Sports South. May 10, 2013. Retrieved May 15, 2013. ^ Bowman, Mark (May 10, 2013). "Kimbrel earns 100th career save". MLB.com. Retrieved May 10, 2013. ^ "Simmons' double lifts Braves past Cardinals". ajc.com. Retrieved August 4, 2015. ^ "Home-field advantage important for Braves". ajc.com. Retrieved August 4, 2015. ^ Pouliot, Matthew (September 28, 2013). "Craig Kimbrel is 11th with 50-save season". nbcsports.com. Retrieved September 28, 2013. ^ Click on "Closer" at "2013 Greatness in Baseball Yearly Awards". MLB.com. MLB Advanced Media, L.P. Retrieved October 31, 2016. ^ "Craig Kimbrel agrees to 4-year deal". ESPN.com. Associated Press. February 16, 2014. Retrieved February 16, 2014. ^ Bowman, Mark (February 16, 2014). "Kimbrel, Braves agree to four-year contract". MLB.com. Retrieved February 16, 2014. ^ Keuler, John (June 5, 2014). "A look at Craig Kimbrel's career highlights thus far". Atlanta. Retrieved August 31, 2014. ^ Taylor, Jon (June 7, 2014). "Braves' Craig Kimbrel continues to rack up saves at record-setting pace". SI.com. Retrieved August 31, 2014. ^ Bowman, Mark (August 30, 2014). "Kimbrel joins short, elite list with 40th save". MLB.com. Retrieved August 31, 2014. ^ O'Brien, David (April 5, 2015). "Braves deal Kimbrel, Upton to Padres". Atlanta Journal Constitution. Retrieved April 5, 2015. ^ Odum, Charles (June 8, 2015). "Kemp, Kimbrel lead Padres over Braves in 11 innings". Athens Banner Herald. Associated Press. Retrieved October 5, 2015. ^ "Kimbrel earns 200th save as Padres beat Braves". Reuters. June 9, 2015. Retrieved October 5, 2015. ^ Abraham, Peter (November 13, 2015). "Red Sox acquire star closer Craig Kimbrel from Padres". Boston Globe. Retrieved November 15, 2015. ^ "Padres trade Craig Kimbrel to Red Sox in exchange for 4 prospects". ESPN.com. November 14, 2015. Retrieved November 15, 2015. ^ "Kimbrel set for surgery, placed on DL". CBS Sports. Retrieved July 9, 2016. ^ Dillon, Kevin (July 6, 2016). "Craig Kimbrel asks to pitch Wednesday regardless of score, records scoreless inning vs. Rangers". The Republican. Retrieved March 1, 2018. ^ Roberts, Quinn (April 29, 2017). "Kimbrel stays in control; 21 of last 22 retired". MLB.com. Retrieved March 1, 2018. ^ Browne, Ian (May 12, 2017). "Statcast of the Day: Kimbrel immaculate in win". MLb.com. Retrieved March 1, 2018. ^ Mastrodonato, Jason (May 26, 2017). "Craig Kimbrel strikes out four in unusual ninth inning". Boston Herald. Retrieved March 1, 2018. ^ "Red Sox Notes on Twitter". Twitter. Retrieved May 6, 2018. ^ Hawkins, Stephen (May 5, 2018). "Craig Kimbrel becomes youngest pitcher reach 300 saves in Boston's 6-5 win over Texas". Boston.com. AP. Retrieved May 5, 2018. ^ Castrovince, Anthony (July 8, 2018). "These are your 2018 All-Stars". MLB.com. Retrieved July 8, 2018. ^ Penney, Sean (November 12, 2018). "Red Sox closer Craig Kimbrel rejects qualifying offer". bosoxinjection.com. Retrieved November 27, 2018. ^ Hurley, Michael (March 28, 2019). "It's Very Strange That Baseball Is Beginning Without Craig Kimbrel". WBZ-TV. Retrieved March 28, 2019. ^ Bowman, Mark (April 15, 2012). "Curveball comes through for Kimbrel". MLB.com. Retrieved August 29, 2012. ^ a b Kepner, Tyler (March 2, 2013). "Pitcher's Stare Is Menacing, but Fastball Is Feared More". New York Times. Retrieved May 18, 2013. ^ "Brooks Baseball · Home of the PitchFX Tool – Player Card: Craig Kimbrel". Brooks Baseball. Retrieved August 13, 2012. ^ "Craig Kimbrel Statistics and History". Baseball-Reference.com. Retrieved August 13, 2012. ^ "Major League Leaderboards » 2012 » Pitchers » Plate Discipline Statistics". Fangraphs. Retrieved August 29, 2012. Minimum 100 innings pitched. ^ "PitchFX Leaderboards". Baseball Prospectus. Retrieved September 20, 2012. ^ Weber, Rick (February 19, 2016). "For new Red Sox closer Craig Kimbrel, best could be yet to come". ESPN.com. Retrieved March 10, 2016. ^ McCarter, Mark (July 8, 2012). "Craig Kimbrel continues to dominate as Braves' ace closer". The Birmingham News. Retrieved February 28, 2015. ^ "Matt Kimbrel Minor League Statistics & History". Baseball-Reference.com. Retrieved May 6, 2018. ^ Goold, Derrick (May 13, 2012). "Carpenter feeling better, expects to throw in June". St. Louis Post-Dispatch. Retrieved February 28, 2015. ^ Rogers, Carroll (October 11, 2012). "With help from Wagner, Kimbrel puts blown save behind him". Atlanta Journal Constitution. Retrieved February 28, 2015. ^ Moore, Russell (January 4, 2013). "Former Wallace State pitcher Craig Kimbrel appreciative of mental toughness he developed while with Lions, proud of program's tradition". Wallace State Community College. Archived from the original on April 2, 2015. Retrieved February 28, 2015 – via National Junior College Athletic Association. ^ Browne, Ian (January 22, 2018). "Kimbrel motivated, focused on daughter". MLB.com. Retrieved March 1, 2018. ^ "Kimbrel leaves spring training for daughter's surgery". ESPN.com. Associated Press. February 28, 2018. Retrieved March 1, 2018. ^ "Red Sox's Craig Kimbrel focused on daughter". MLB.com. Retrieved May 3, 2018. Wikimedia Commons has media related to Craig Kimbrel.